Cats lick themselves all over, then they leave their discarded fur all over your house & clothes. Cats have greasy coats that shed, combined with licking this creates knots, mats & a dirty smelly coat. Cats who “groom” themselves without help can develop hairballs, which they also tend to leave all over your house and clothes and can cause serious health issues for your cat. A cat “grooming” itself is no comparison to a professional groom including a bath and blow dry. Majority of cats tolerate water very well & a lot even enjoy it. A bath at home when you are anxious about your cat’s behaviour is a very different experience to a bath with a professionally trained cat groomer who knows how to handle cats. Some cats may take a few moments to get used to the dryer, however most cats settle into the process & believe it or not actually find it relaxing. Don’t believe us? Watch the video below. Short haired cats shed a LOT. We have many owners who bring in their short hair cats for regular grooming. A bath, blow dry & de shed treatment can reduce shedding by up to 80%. A lion clip reduces evidence of shedding even further. Many timid cats do well with the grooming process, in fact they often surprise their owners with how well they settle into the whole groom. Our experience and training allows us to identify a stressed cat and we can use alternative techniques if required. We do not sedate any cats that we groom. With the correct training & techniques, even the most aggressive or timid cat can be safely groomed without sedation. A small amount of cats actually NEED to be sedated for grooming and if we come across one, we are happy to refer onto a vet who can do the procedure. We regularly groom 18+ year old cats. It is very important to have older cats regularly groomed, as due to old age and loss of mobility they are often unable to maintain their coats themselves. Older cats seem to really appreciate being groomed as it often brings added comfort to them. They also seem to appreciate being clean! 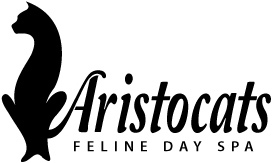 We can tell you over and over again about the amazing results you will experience having your cat groomed by Aristocats. The only way you will ever know for a fact is to bring your cats in to see us. We know you will love the results.